African Mango seed extract has beneficial effects on several key metabolic parameters related to optimal body composition. It has been shown to help regulate adipogenesis, the process of forming fat cells in the body. African mango seed extract plays a beneficial role in regulating blood lipid levels and improving insulin sensitivity by supporting healthy adiponectin levels in the body. 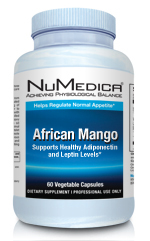 Studies have also shown that African mango seed extract favorably impacts leptin sensitivity. Leptin, a hormone secreted by fat cells, sends signals to the brain to indicate when we have had enough to eat. When our bodies become resistant to leptin, they are less likely to respond appropriately to the signals indicating a sense of fullness. Contains No: Yeast, wheat, gluten, milk, salt, sugar, preservatives, artificial flavor and color.